If You Must Talk, Whisper! 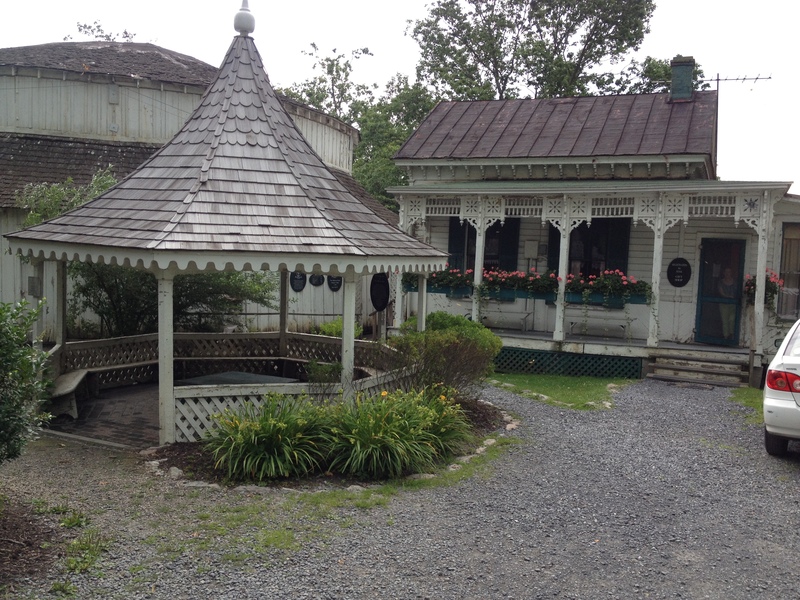 It was a spur of the moment decision to stop at the baths in Warm Springs, Virginia, which are officially known as the Jefferson Pools because Thomas Jefferson soaked in the men’s hut in 1818 for 22 days. I did not have my bathing suit but remembered that there was always a basket of bathing dressses inside the door of the hut. Although not fashionable, they provided full coverage and were made of cotton in colorful designs. I went into the cottage adjacent to the hut to pay. I mentioned that I did not have a bathing suit, but hoped to use one of the bathing dresses. The woman at the counter informed me that the woman who made the little jumpers had died and the suits had been removed. A cheerful young man who probably monitored the men’s hut, and was carrying cheeseburgers in baskets for the woman and himself, said, “It’s not so bad. There are three ladies in right now who faced the same issue. They decided to bathe anyway. You can just sneak in. Besides, they are about to leave, and the two young women in there now will have to leave soon.” It turns out that the Homestead bus service would be retrieving them for return to the resort hotel. Had the time come to be more adventurous than I usually am? I do not swim au naturelle. I have never worn a bikini and it is safe to say that I will die without ever having worn one. For a fee, one has an hour of soaking time. I paid and proceeded. I met the next attendant, a woman who sits in the entry way of the hut dispensing towels. I found a cubicle right by one set of stairs into the pool. A nervous mermaid, I unswathed my towels and slipped in without the two young ladies in bikinis noticing me, I believe, and soon they were called away, so I had the healing springs to myself. I poked my head out to the bathing attendant, “Can I take photos?” “As long as no one else is there,” she answered. Inside of circular hut showing noodles tucked in spaces of the wall. Inside the hut white paint peels artfully over wooden boards. Some visitors have commented that the whole appearance is run down. So it is, but run down straight from the 18th century to the 21st, and I find that extremely beautiful. Yes, restoration is in order, but I feel as if I am right there with Thomas Jefferson, though I am glad that he would be in the men’s hut, and I would have privacy. He was a complicated man, and I am sure that he benefitted from his days of reflective soaks in a men’s-only hut. While he came for his rheumatism, I can imagine his mind drifting to thoughts of his past and his future. He wrote a letter from Hot Springs to his daughter noting that the baths were first rate. Another view of curving wall with noodles. Although the noodles in bright shades of lime green, pink, purple, and blue look out of place perhaps, they are indispensable for a really comfortable soak. One can drape oneself over one, two, or three to find a position for total relaxation, for instance, floating on one’s back. I drift like the clouds in the blue sky visible through the opening in the roof. 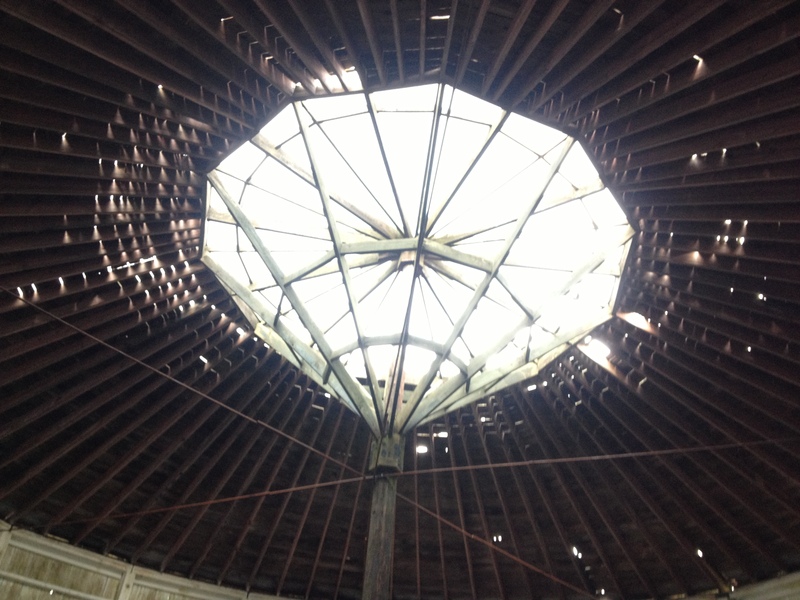 I have tried before to describe the architecture of the open roof in words and found it difficult. 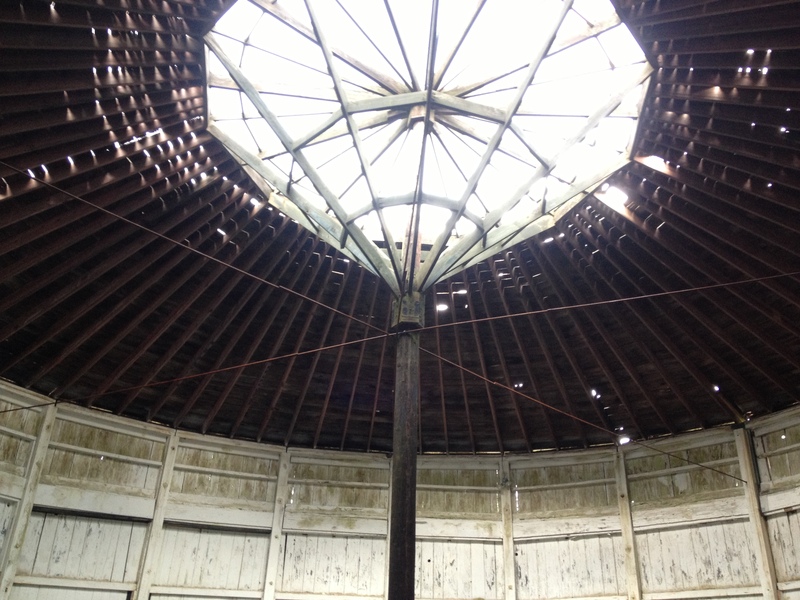 The view of the sky and the clouds piecemeal through the spokes of the dome captures attention. I have never been in a space similar to this, though my husband reminds me that the structure is very much like the oculus of the Parthenon in Rome, but so much the better to be immersed in healing waters, which are warm, about 98 degrees, and clear. There is a very slight sulfurous smell. 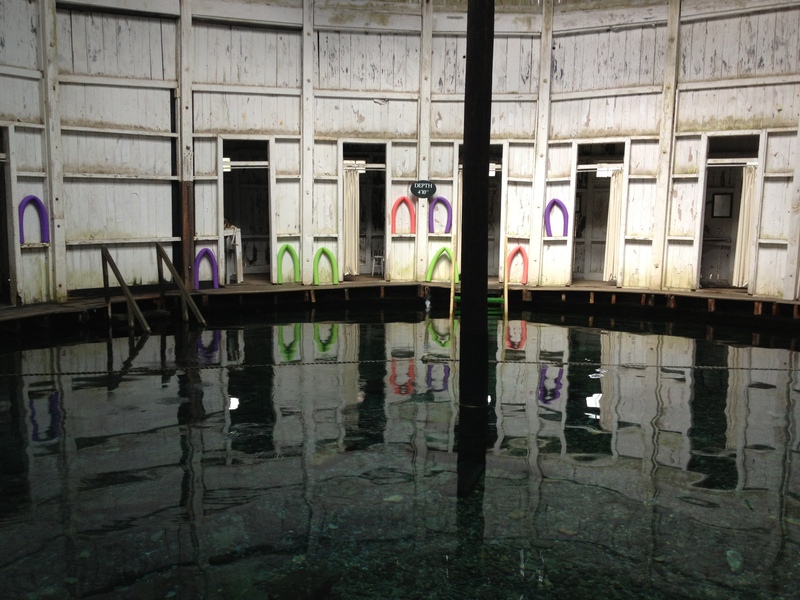 The Homestead‘s website conveys some of the 9,000 year history of the baths and interesting statistics about the rate of flow and qualities of the water. I floated with the noodles, I let the bubbles swirl up around me, and I stared up at the ceiling of the hut through which I could see the sky and passing clouds. I meditated on time and space, and then I slipped into my towels and commenced taking a few photos with my i phone. I knew I had a unique opportunity. 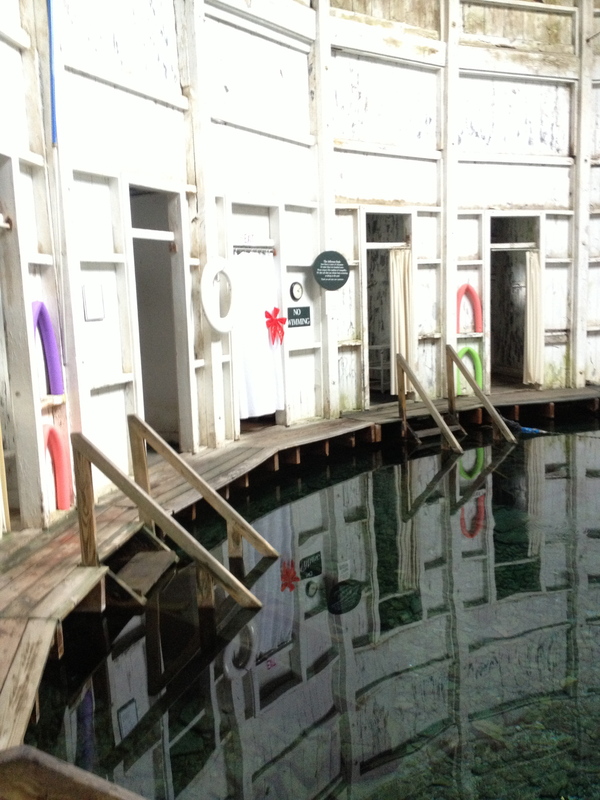 It is hard to convey the magic of the bathing hut without a photo or two. 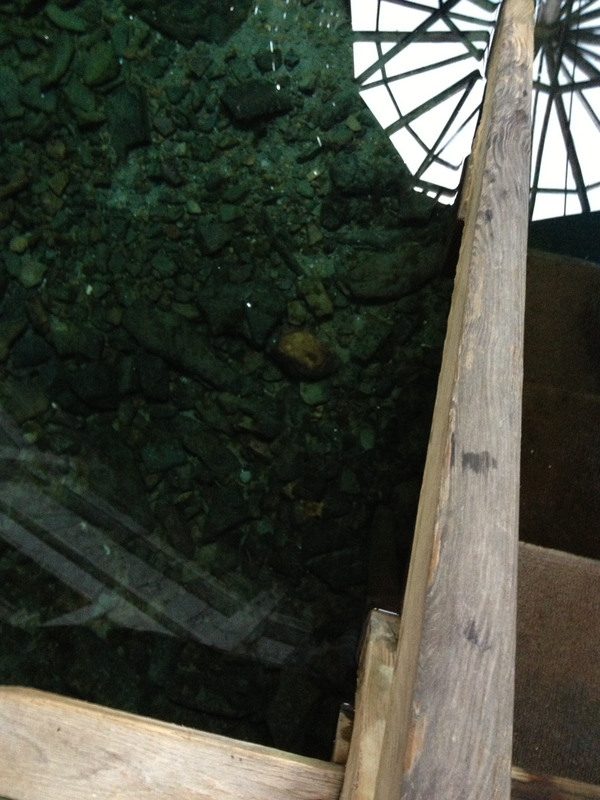 Reflection of central post attaching to center of roof in the healing waters below. Pebbles appear luminous in the slightly blue-green water. 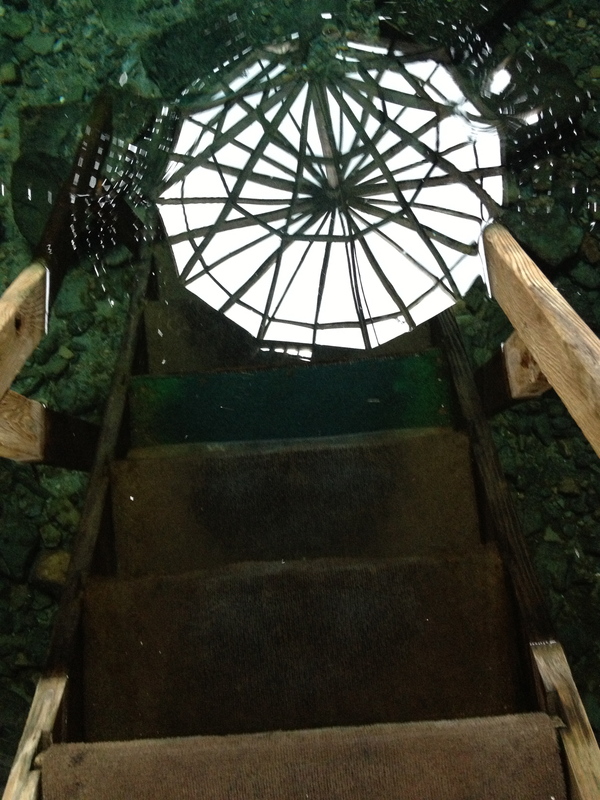 But as I was going in and out, mermaid like, taking pictures and soaking, I noticed that the design of the roof was even more beautiful reflected in the water. 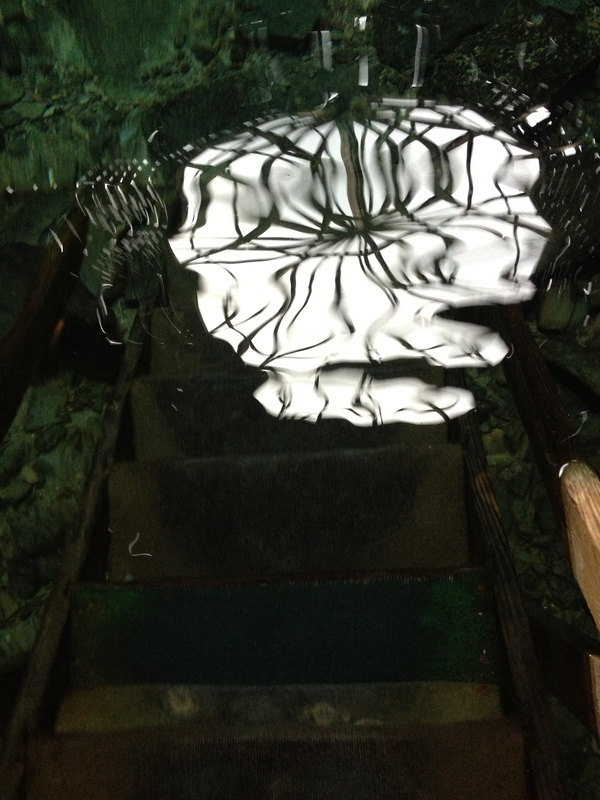 The reflection accompanied me, swirling from little to big. I put my hand in it, causing the reflection to wobble and gyrate. It was mesmerizing watching the reflection settle back into itself. 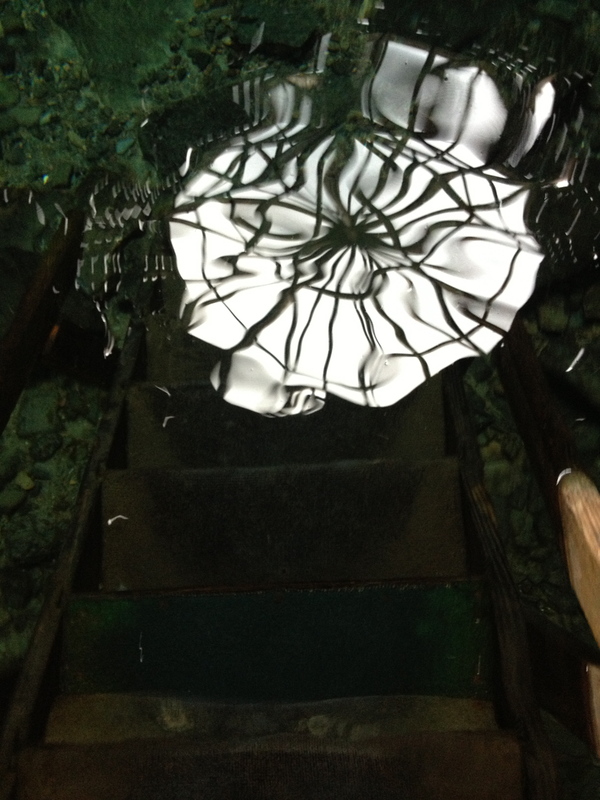 Reflection of roof architecture in water, wobbling. I emerged from my soak relaxed, wholesome, a noodle, a strand of perfectly cooked spaghetti. The waters are body temperature and flow at 1,700,000 gallons per day, conditions that render the human body mellow and agreeable. Departing in excellent spirits, I thanked the attendants for their encouragement: the au naturelle method of bathing is fine. The bubbles that percolate up one’s torso and the wobbling reflection of the oculus at one’s elbow distract body and mind from anxious concerns. I hope Thomas Jefferson achieved similar moments of serenity. 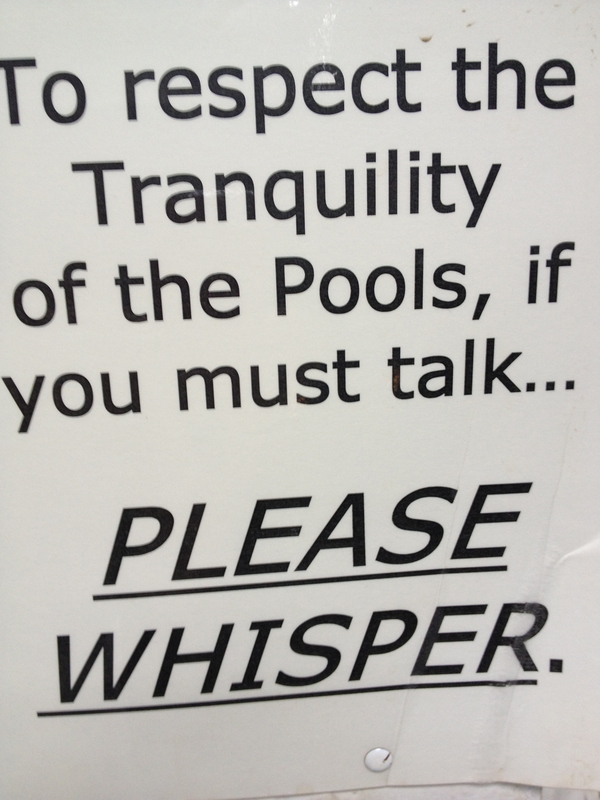 I understand the admonitions posted at various point around the pool. Like the reflections of the oculus, human beings wobble and wobble and wobble in so many forms of uncertainty. Drifting this way and that, I soon hear a serene silence inside my body, so soothed by the warm spring with its minerals and cheerful bubbles.